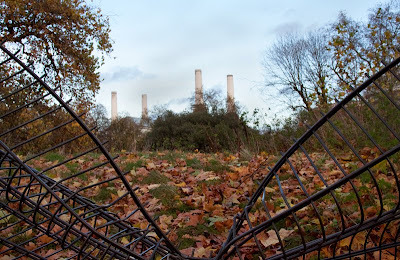 Walking through Battersea Park you can see the now disused power station on the horizon. There have been plans for new generation here on and off for many years. The latest ambitions plans can be seen here. Excellent shot. Nice to see an original view such a famous landmark. I was living next to that park on my last stay in London! nice original shot ! the link is very interesting, what a huge project ! Any time new power plants are proposed here, people scream, "Not in my backyard you don't." I like the iron "butterfly wings". Hi! When i see this tower of the powerstation i think about Pink Floyds Animals, is it Battersea powerstation on the lp envelope? Great album anyway! Cheers! The plans look tremendous. I used to drive past it every day. There have been so many plans for it for decades. Hope these come off. I've only seen the power station from the other side of the river but I found it absolutely magnificent. I'm glad London has the vision to see potential for these buildings. In Canada it would probably have been knocked down by now. I first thought that these plans would mean using the park land, but I understand now that fortunatley that's not the intention; it's only to fill up the space around the power station! Good autumn picture. I think I was in this park in my last travel in London before couple years. I don't remember exactly the deal with the disused power station, I concentrated much more on the beautiful views of the best city in the world!